Free Shipping Included! Original Audrey Hepburn ''Breakfast at Tiffany's'' Complete Costume Set - Cotton Version (L) by Utopiat at The Black Pearl. Hurry! Limited time offer. Offer valid only while supplies last. Don't settle for the cheap imitations! 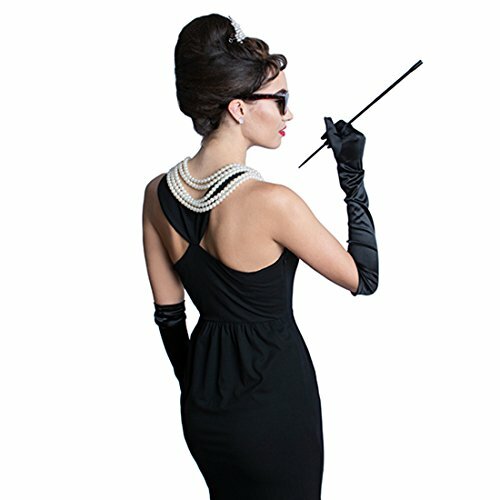 Let your inner Audrey shine through with our truly amazing, fully customized Audrey Hepburn Black Costume Set. Wow the crowd with your lovely audrey grace in our complete Holly Golightly black dress assemble, with each piece of the costume being painstakingly designed and tweaked to achieve the closest, most flattering imitation to the original version featured in the film. This is our original Cotton Dress version that is designed for easy wearability and flatters most body forms. What's more, the dress and accessories are of a quality that you will not only want to wear for Halloween but can be taken apart to add Audrey elegance to your everyday wardrobe! If you have any questions about this product by Utopiat, contact us by completing and submitting the form below. If you are looking for a specif part number, please include it with your message.